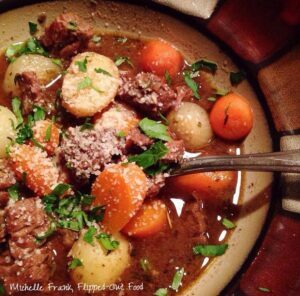 Beef stew is a must-have for cold winter nights. The broth is rich and complex, and the meat is fall-apart tender. This is the perfect meal to put in the crock pot and leave alone for 8 hours, or you can do it in your oven in 3-4. This is my take on the classic beef stew recipe I learned from my grandmother. The beef stew’s broth gets its complexity from several flavor-building tricks. I Like to rehydrate porcini mushrooms in scalding liquid, then strain the “mushroom juice” and add it to my cooking liquid mix. Even more important to this rich-tasting stew is the meat-browning step followed by a deglaze with wine. The resulting mixture is infused with the beefy, delicious scrapings from the bottom of the pan. There’s really no substitute. If this sounds like a lot of work for a meal during the workweek, relax: the great part is that you can do all of that the night before! One non-delicious drawback to most classic crockpot beef stew recipes is that the vegetables tend to overcook and turn to mush. Thus, one departure I take in this recipe is that I parcook the vegetables and add them to the stew during the last 15-30 minutes of cooking time. This technique allows the flavors to meld, but preserves the texture of the vegetables. I like to top this vintage beef stew with grated Romano and a sprinkling of flat-leaf parsley. This is a great time to have some crusty bread on hand to sop up the last remnants of delicious broth. I always enjoy the stew with a glass of the wine (usually the same one I used in the broth: if you wouldn’t drink it, you shouldn’t cook with it!). If you can let the stew sit in the refrigerator overnight, it’s even better. And even BETTER the day after that. This is a version of the classic beef stew recipe we all grew up with. 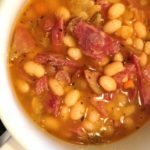 It’s a family favorite for cold winter nights, and it’s perfect for busy weekdays because—with a little prep the night before—you can pop it in the crockpot and go. Dry the meat with paper towels and season generously with salt and pepper. Set a heavy-bottomed pot over medium-high heat and add the oil. When the oil is hot, add 1/4 of the meat cubes. Brown the meat cubes deeply on two sides, then remove to a bowl and add the next small batch of meat cubes. Repeat until all meat cubes have been browned, adding more oil as necessary. Reduce heat to medium and add the diced onion, adding more oil to the pot if needed. Sauté until softened, 4-5 minutes. Add the garlic, rosemary (stem too! ), and bay leaves; sauté an additional minute. Stir in the red wine to deglaze the pot. Stir for 30 seconds, being sure to scrape any browned bits off the bottom of the pot. (SEE RECIPE NOTES FOR WORK-AHEAD OPTION) Add the cooking liquid. Stir until combined. 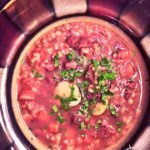 At this point, you can add the contents of the pot to a slow-cooker, along with the meat and any accumulated juices, a couple of pinches of salt, and a few grinds of black pepper. Set on low and leave alone for at least 6 hours and up to 8. OR, you can add the meat and juices back to the pot, season, bring to a boil, then place in a 325-degree oven until the meat is fork-tender, about 3 hours. Skim any excess grease from the top of the stew with a spoon, or add as much of the broth as you can easily remove to a fat separator (see notes). Add the degreased broth back to the pot or slow-cooker. Steam or par-boil the remaining vegetables until you can pierce them easily with a paring knife (there shouldn't be any resistance at all). Then I add the vegetables to the stew for the last 15-30 minutes of cook time and turn the slow-cooker to high. Remove the bay leaves and rosemary stem. Ladle the stew into bowls and garnish with chopped parsley and a light sprinkling of Romano cheese. Serve. Enjoy! 1. To easily remove the skins of the onions, boil them for 2-3 minutes. Cut off the root. They should squeeze right out of their skins. 3. This stew is great when made a day in advance. You can skip the degreasing step in this case: simply refrigerate and use a large spoon to remove any solidified fat on top of the stew before reheating. Reheat gently on the stove-top. WORK-AHEAD: you can complete all steps up to (and including) deglazing the pot with wine. Store the contents of the pot in the refrigerator overnight, then add to the crockpot along with the cooking liquid. It’s almost March and we have predictions of ice rain flying around. I wanted comfort food that warmed me up, but didn’t want to go completely to the dark side and give in to the little voice screaming “mac ‘n cheese!” I happened across this recipe and thought it fit the bill. I chose to use 2 cups of rehydrated porcini mushroom stock, 1 cup of wine, and 2 cups of beef stock for my cooking liquid. Into the slow cooker it went. I cooked it overnight, threw in the par-cooked veg, and finished. The apartment smelled great! After work, I easily skimmed off the fat and reheated. This was so good! Thanks for cheering me up in the mid-winter doldrums! That parsley and cheese on top look beautiful and the stew looks delicious! Oh that is just sooo flavourful! I love the addition of the pearl onions, I always find them more intensely flavoured than the regular ones! Thanks, Tina! Yes, I LOOOOVE pearl onions in soups and stews! Cannot beat a really good beef stew and this one does look delicious. Like you, we like to deglaze the browning pan so that all the caramelised bits are retained and go into the slow cooker! Yum! Thanks Kavey! I agree: that flavor step is absolutely critical. I love the idea of using dried mushrooms to enhance the beefy flavor! I seem to be adding mushrooms to everything lately but have not tried that method. This looks so good…snow here. Need it now! Thanks Kathi! Yep, it’s snowy here too and I’m sick of it! NEED COMFORT FOOD. I can almost smell and taste it from here it sounds that good!